PM Netanyahu at swearing-in ceremony for new Deputy Chief of Staff: We'll get terrorists just as we got Barkan and Ofra terrorists. Prime Minister Binyamin Netanyahu responded to the murder of two soldiers in a terrorist shooting attack in Binyamin Thursday, saying that "whoever tries to harm us, his blood is on his head." 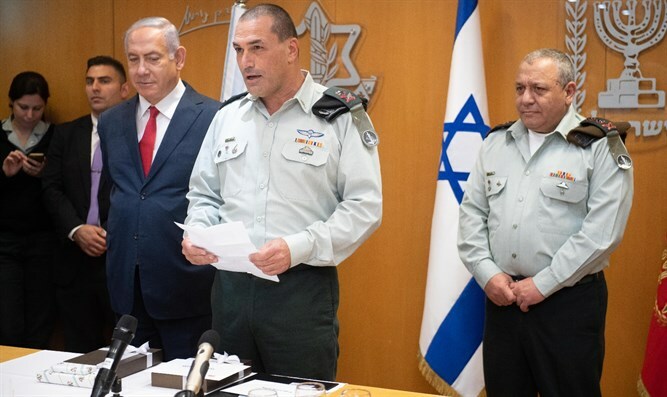 Speaking at the swearing-in ceremony for new IDF Deputy Chief of Staff Eyal Zamir, Netanyahu said: "Last night we came to an account with the murderers of the terror attacks in Barkan and Ofra, and today we have suffered a serious attack with dead soldiers. e'll settle accounts with whoever did it. The principle that guides us is that whoever harms us and anyone who tries to harm us - his blood is on his head. Our enemies know this and we will get them." IDF Chief of Staff Gadi Eizenkot said at the ceremony: "Replacing the deputy chief of staff is a very significant event, and we are changing the guard today at the opening of a very challenging weekend that teaches us about the challenges we face. The Gaza Strip, the attempts to establish an Iranian presence in Syria, the Lebanese arena - we are in the course of the operation to disrupt and thwart the Hezbollah program into terrorist terrorist tunnels that cross into Israeli territory, and of course the Palestinian arena where only this week we witnessed attacks in Judea and Samaria." "We do not need reminders to remember our mission. The war on terrorism, and our enemy in cooperation with the Shin Bet and the Israel Police is part of our daily mission. Unfortunately, the successes are not 100 percent, and there are attacks that we cannot thwart. We will come to terms with those who harm IDF soldiers and Israeli civilians, so we did last night with the terrorists from the terror attacks in Barkan and the Ofra Junction, and so will do with the terrorists from the attack this morning," Eizenkot promised. A newborn baby was killed and six civilians wounded in a shooting attack at the Ofra Junction on Sunday. The child was delivered prematurely after his mother was critically wounded by a gunshot to the lower abdomen and died four days after being born. Earlier Thursday, a terrorist opened fire at a bus stop near Givat Assaf, killing two IDF soldiers and wounding two other people. A soldier was injured in a ramming attack near Psagot on Thursday afternoon.